Cut the butter into 1-inch cubes. Refrigerate for at least 30 minutes, or freeze for 10 minutes. In a large bowl or electric mixer, whisk together the flour, sugar, baking powder, baking soda and salt. Using the electric mixer, mix in cubed butter until it's the size of small walnuts. Stir in the cream until the flour is just moistened and the dough starts to come together in large clumps. Stir in the lemon zest and poppyseeds. Knead the dough in the bowl just until it holds together, and turn it out onto a lightly floured board. Preheat the oven to 400°F 30 minutes before baking. Have an oven rack at the middle level and set a baking stone or baking sheet on it before preheating. Lightly flour the top of the dough and roll it out into a long rectangle 1 inch thick and about 8 inches by 12 inches; use a bench scraper to keep the edges even by smacking it up against the sides of the dough. Fold the dough in thirds, lightly flour the board again, and rotate the dough so that the closed side faces to the left. Roll it out again and repeat the “turn” 3 more times, refrigerating the dough, covered with plastic wrap, for about 15 minutes as necessary only if it begins to soften. Trim the edges so it will rise evenly. (To use the scraps, press them together and roll out, giving them 2 turns, then roll the dough into a 1-inch-thick square and cut into 2 triangles.) Cut the dough in half lengthwise so you have 2 pieces about 4 inches by 12 inches. Cut dough into triangles with about a 3-inch-wide base and place them about 1 inch apart on the prepared baking sheets. (The dough will rise but not expand sideways.) If the dough is soft, cover it well with plastic wrap and freeze for 15 minutes or refrigerate for 1 hour before baking. Bake the scones one sheet at a time; cover the second sheet with plastic wrap and refrigerate while you bake the first one, then bake the second pan directly from the refrigerator. Place the pan on the hot baking stone or hot baking sheet and bake the scones for 15 to 20 minutes or until the edges begin to brown and the tops are a golden brown and firm enough so that they barely give when pressed lightly with a finger (an instant-read thermometer inserted into the center of a scone will read about 200°F). Check the scones after 10 minutes of baking, and if they are not browning evenly, rotate the baking sheet from front to back. Do not overbake, as they continue baking slightly on removal from the oven and are best when slightly moist and soft inside. Place two towels on two large racks and, using a turner or spatula, lift the scones from the baking sheets and set them on top. Fold the towels over loosely and allow the scones to cool until warm or at room temperature. It’s nice every once in a while to have a little help in the kitchen. 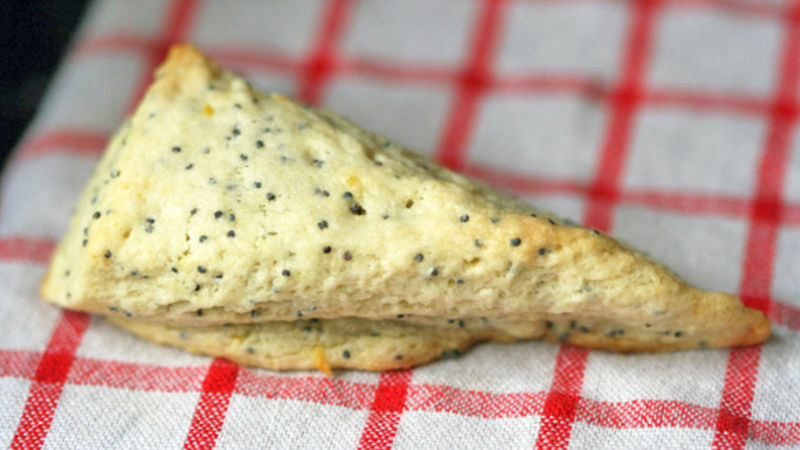 And these Flaky Lemon Poppyseed Scones are the perfect recipe to make with another set of hands. Scones are so easy to make with others because there’s no yeast – thus, no waiting around for the dough to rise – and it involves a lot of interaction with rolling out the dough and cutting it into triangles. This particular recipe yields a crumbly, buttery scone with a hint of citrusy flavor and a lot of deliciousness. Baking is usually a solitary process for me. It’s a lot to ask my husband (or my cat or a friend) help me mix together ingredients, let the dough rise, shape it, let it rise again…and then bake it. There’s either not enough work to share or the whole process doesn’t keep their interest long enough to stick with it past the first rise. Or, I get all control-freak on them and take over all the prep work (I tend to do that; it’s a curse)! I first made these scones on my blog to help my little brother, Matt, with a school project (which really meant I did most of the work and he took the credit…oh well, he’s the one who needs the grade anyway). Though my control-freak side tried to creep up every once in a while, it was fun to share in a baking endeavor with my sibling. He’s really into cooking and muses about being a chef someday (that is, when he’s mature enough to wield a knife, which will be all too soon). With my love of baking, we both often find ourselves in the kitchen making some sort of food. This time it was these scones. Though I have no control over my brother getting older by the second, I do have this memory of baking with him – and that keeps me company any time I’m in the kitchen.